album design The design aim for this promotional album was to achieve a unique, eye-catching look without the budget for standard, high-cost packaging. 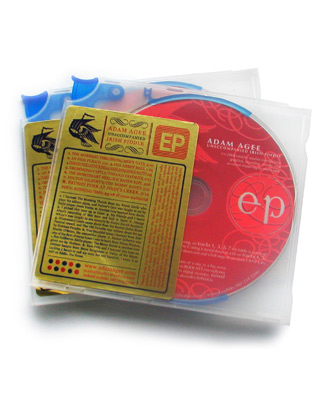 In an effort to avoid the underwhelming appearance of too many low-cost CD projects, the playful 'ejector-case' was paired with a cheap, 2-color, custom label from a shipping supplies company. The gold foil and the juicy red, screen-printed disc developed from an inspiration to cause the user to drool by simulating the experience of beholding a delicious candy.